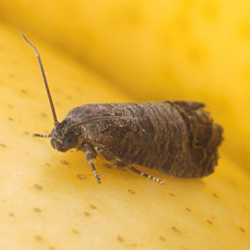 Cydia pomonella is likely the most harmful pest of apples worldwide and also an important pest of pears, quinces and walnuts. They may also attack Prunus species, such as peaches. Larvae bore into fruits, carving galleries inside. Damage may go unnoticed in the earlier part of the season because their attack causes the dropping of young fruitlets. Adult moths are seldom seen because they are active mostly at dusk, resting in the foliage during the day.